The Altalena, purchased by Irgun members abroad, was originally intended to reach Israel on May 15, 1948, loaded with fighters and military equipment. Weapons purchase and organizational matters took longer than expected, however, and the sailing was postponed for several weeks. Meanwhile, on June 1st, an agreement had been signed for the absorption of the Irgun into the IDF and one of the clauses stated that the Irgun had to cease all independent arms acquisition activities. Consequently, representatives of the Israel Government were informed about the ship and its sailing schedule. The Irgun headquarters in Paris did their best to keep the Altalena's preparations for departure a secret, but it was difficult to conceal the movement of 940 fighters and the loading of a large quantity of arms and ammunition. It was feared that if the plans were discovered, attempts might be made to sabotage the Altalena at sea. For this reason, when it raised anchor on June 11th, no cable was sent to the Irgun command in Israel, for fear that it would fall into the wrong hands. These precautionary measures proved fruitless, however, and the following day Radio London reported that the Altalena had sailed from Port-de-Bouc (France) in the direction of Israel with 1,000 Jewish volunteers and a large quantity of weapons on board. It should be recalled that the first truce had begun on June 11th. When the Irgun leaders in Israel learned through the broadcast of the embarkation of the vessel, they feared that this breach of the truce conditions (i.e. the ban on bringing military equipment and fighters into the country) would be revealed. Menahem Begin decided therefore to postpone the arrival of the ship, and the Irgun staff secretary, Zippora Levi-Kessel, sent a wireless message to the Altalena to stay put and await orders. A similar cable was sent to Shmuel Katz (member of the General Headquarters), who was then in Paris, but contact with the ship was poor and the message was not understood. Begin had meanwhile boarded the Altalena, which was now heading for Tel Aviv. He hoped that it would be possible to enter into a dialogue with the Provisional Government and to unload the remaining weapons peacefully. But this was not the case. 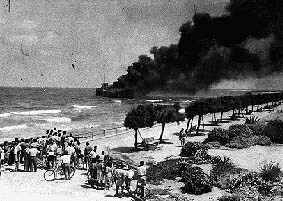 Ben-Gurion ordered Yigael Yadin (acting Chief of Staff) to concentrate large forces on the Tel Aviv beach and to take the ship by force. Heavy guns were transferred to the area and at four in the afternoon, Ben-Gurion ordered the shelling of the Altalena . One of the shells hit the ship, which began to burn. There was danger that the fire would spread to the holds which contained explosives, and the captain ordered all aboard to abandon ship. People jumped into the water, whilst their comrades on shore set out to meet them on rafts. Although the captain flew the white flag of surrender, automatic fire continued to be directed at the unarmed survivors. Begin, who was on deck, agreed to leave the ship only after the last of the wounded had been evacuated. 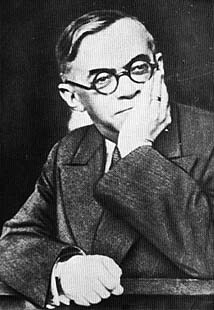 In 1936, Jabotinsky met with the Foreign Minister, Josef Beck, and created the infrastructure for collaboration. The Polish government hoped that the establishment of a Jewish state would lead to mass emigration of Jews, thus solving the Jewish problem in Poland. In November 1937, Avraham Stern (Yair), then secretary of the Irgun General Headquarters, arrived in the Polish capital armed with a letter of recommendation from Jabotinsky. He met with senior government officials and laid the practical foundations for cooperation between the Polish army and the Irgun Zvai Le'umi. Within the framework of this cooperation, Polish army representatives handed over to Irgun representatives weapons and ammunition which had been kept in special ammunition depots. The weapons remained under Polish army supervision until they were despatched to Eretz Israel. Some of the weapons were concealed in the false bottoms of crates in which the furniture of prospective immigrants was transported, or in the drums of electrical machines. When the consignments reached Eretz Israel, they were taken to a safe place, and the weapons were removed from their hiding place. When in Warsaw Avraham Stern was much helped by Dr. Henryk Strasman, a well known lawyer and an officer in the Polish Reserve force. His wife Alicja (Lilka) was also of great help. The Strasmans introduced Stern to the Polish intellectuals and high officials. It was in their home that the preparations for the publication of the Polish periodical "Jerozolima Wyzwolona" (Free Jerusalem) were begun. It was Lilka who designed the cover - A map of Eretz Israel with the background of an arm holding a gun and the words in Hebrew: "" (This Way Only). This became later the symbol of the Irgun. When the course ended, they returned to Eretz Israel, apart from three who remained in Poland: Yaakov Meridor, who was responsible for despatching the weapons received from the Polish army; Shlomo Ben Shlomo, who organized a commanders course for selected members of Irgun cells in Poland (Isaac Raviv was one of the participants), and Zvi Meltzer, who organized a similar course in Lithuania. The organization of clandestine Irgun cells in Europe had begun a year previously, and was mainly conducted among members of Betar. The plan was to train a cadre of fighters, who would immigrate to Eretz Israel illegally, bringing arms with them, to become a kind of commando corps. 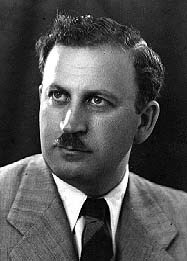 Avraham Stern was involved in organizing the Polish cells, and was assisted by Nathan Friedman-Yellin (member of the Irgun commission in Poland) and Shmuel Merlin (General Secretary of the New Zionist Organization in Poland). The outbreak of the Second World War, on September 1, 1939, cut short the extensive activity of the Irgun in Poland and Lithuania. Most of the arms which the Irgun had received were returned to the Polish army and Irgun activity ceased. After the war, the Irgun General Headquarters decided to renew activity in Europe and to launch a "second front". The task was assigned to Yaakov Tavin, who was smuggled there aboard an Italian oil-tanker. The first base was established in Italy, where there were more than a thousand organized Betarites (Betar members), who had arrived with the flood of Jewish refugees from Eastern Europe, Germany and Austria. Among the Betarites were several members of the "cells" the Irgun had established in Poland and Lithuania in the late 1930s, and they formed the nucleus of the Italian branch of the Irgun. Irgun cells were also organized in the British zone in Germany, under Isaac Raviv. After organization and consolidation, it was decided to commence operational activity, and the first target selected was the British Embassy in Rome. Preparations were protracted, and the planners made every effort to prevent civilian casualties. On the night of October 31, 1946, three young men set out from a pension in the city with two suitcases. They entered a waiting taxi, and drove to the Embassy, which they reached after midnight and unloaded the cases. After setting the time fuse, they propped the two suitcases against the main door of the building and left the area. At 2:46 am, there was a loud explosion and the central section of the building was destroyed. The explosion was heard throughout the city and windows were broken within a radius of one kilometer. The sole casualties were two Italians who had been passing by on their way home from a nearby night club. The incident made a strong impression throughout the world. The British press reported the incident in detail, and the public was greatly shocked. Emergency measures were adopted in London; security was increased around government ministries, senior politicians were guarded, and orders were given to tighten security in British embassies in European capitals. As a result of the arrests in Italy, Irgun Headquarters in Europe were transferred to Paris. Meanwhile, branches had been set up in various parts of Europe, and attempts were made to strike at British targets, such as the Sacher Hotel in Vienna, the regional British army headquarters. The explosion there caused light damage to the building, but the propaganda impact was considerable. A train transporting British troops was sabotaged, and an explosion occurred in the hotel in Vienna which housed the offices of the British occupation force. However, the blowing up of the British embassy in Rome remained the pinnacle of Irgun operational activity in Europe. Although most of the illegal immigration activity was carried out by the Haganah's Mossad Le'aliyah Bet, Irgun representatives played central roles in several places. Yosef Klarman, who had organized illegal immigration in the 1930s, was sent by the Irgun to Rumania in September, 1944. He succeeded in establishing close contact with the Rumanian authorities, and was even received officially by King Michael and Queen Helena. He became the liaison officer between the Haganah and the authorities, and the central figure in immigration activities. In August, 1947, for example, the Rumanian authorities, under Soviet pressure, prevented the two immigrant vessels, Pan York and Pan Crescent, from leaving Constanza port. It was thanks to Klarman's contacts with the relevant persons in the Rumanian government that the ships were eventually permitted to sail. Shmuel Ariel, sent to Paris by the Irgun in early 1946, was in charge of immigration. Ariel established good contacts with the French authorities, and the Haganah called on his services extensively in connection with sailings from France. Thus, for example, Ariel succeeded in negotiating with the French Ministry of Interior the granting of 3,000 entry visas to Jewish refugees arriving in France en route to Palestine. Some 650 of them left aboard the Ben Hecht, 940 on the arms vessel Altalena, and the remainder were transferred to a ship organized by the Haganah. Thanks to Ariel's close contacts with the French authorities, the Irgun General Headquarters was permitted to operate in Paris without interruption, and to supervise activity in the many branches all over Europe. As noted above, the Second World War halted Irgun activity in Europe. Several of the Irgun's emissaries left Europe for the United States and joined the activities of the "American Friends for a Jewish Palestine". The mission in the United States was headed by Hillel Kook (who had been a member of the Irgun General Headquarters in Palestine); the other members were Aryeh Ben-Eliezer, Yitzhak Ben-Ami, Eri Jabotinsky, Alexander Rafaeli and Shmuel Merlin. They launched independent political efforts, initiated a propaganda and information campaign and undertook fundraising activities until the State of Israel was established. When information on the extent of the Holocaust began to arrive, the mission initiated an information campaign to bring the facts to the knowledge of the public. Full-page advertisements in the leading newspapers appealed for the rescue of European Jewry before it was too late. An "Emergency Committee for the Rescue of European Jewry" was established, with the participation of senators and congressmen, writers and public figures, both Jewish and non-Jewish. The Emergency Committee launched widespread information activities, and initiated an appeal to the President by Congress and the Senate that immediate action be taken to rescue the remnants of European Jewry. The proposal was ratified by the Foreign Affairs Committee of the Senate, and President Roosevelt subsequently issued an administrative order for the establishment of a special national authority to deal with war refugees. An official emissary sent to Turkey was of considerable assistance in the rescue of Rumanian Jewry. As the Second World War approached its end and a revolt was proclaimed against the British rulers of Palestine, the Irgun mission in the United States announced the establishment of the "Hebrew Committee for National Liberation". The committee engaged in diplomatic efforts and informed the US public of the Irgun's war against the British. The establishment of the committee was announced by Peter Bergson (Hillel Kook) at a press conference in Washington in a building which the mission had purchased from the Iranian Embassy. A Hebrew standard and the US flag were raised with a sign reading "Hebrew Embassy". After the establishment of the State of Israel, the building was donated to the Israeli Embassy in Washington.